is finally here! While our adrenaline is still charged and pumping, without further ado, Let's get going! The java version consists of a slightly different storyline; The game consists of a ‘Free play’ mode, as well as a ‘Career’ mode, where the racer must race his way across a number of Racing leagues, winning all the races and additional challenges in each of them, to ultimately become ‘The Lord of Asphalt’ as the game reaches 100% completion. The player starts with a stock Ford Shelby GT 500, and has the option of unlocking a number of other sports cars during his quest. A new added feature in the game is the ‘Adrenaline mode’, which is achieved on hitting nitro while the meter is full. While availing Adrenaline mode, the player’s car becomes virtually indestructible; with the ability to easily crash opponents and cop cars. *Normal Race: The traditional 3-lap race where the player starts from the bottom of the grid, with the objective of finishing 1st at the end of the race. *Beat’em All: In this type of race, the player’s objective is to crash a certain number of opponent and/or police cars before the time runs out. 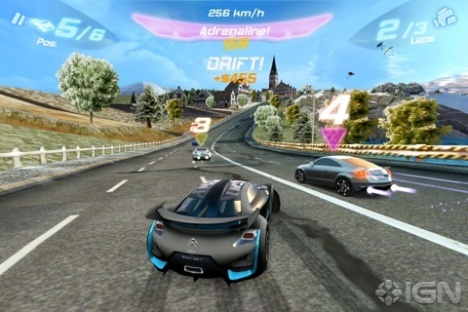 *Drift: This mode features the player as the only racer on the track, with the objective of drifting for a given amount of time, while avoiding speed barriers as they add a 1-second time-penalty each time the player runs through one of them. There are no cops in this mode. *Time Attack: Similar to the Drift mode, but the objective being, to complete a given number of laps before the time runs out. *Wanted: In this mode, the player’s objective is to complete a certain number of laps without getting busted by the police chase cars or road blocks. *Duel: A one-on-one drag race, where the player must finish 1st to win. *Collector: In this mode, the player’s objective is to collect a given number of money items before the time runs out. Critics' Take: This is the Ultimate racing game for the Java platform. Enough said!